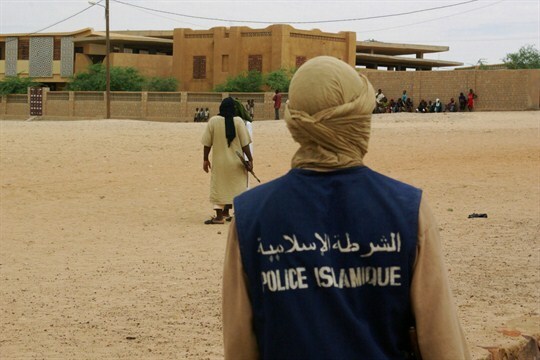 An Islamic Police officer walks through the square where members of the group Ansar Dine were preparing to publicly lash a person found guilty of adultery, Timbuktu, Mali, Aug. 31, 2012 (AP photo). In this week’s Trend Lines podcast, WPR’s editor-in-chief, Judah Grunstein, and managing editor, Frederick Deknatel, discuss a framework deal announced by U.S. and Taliban negotiators and the broader implications of an eventual American withdrawal from Afghanistan. For the Report, Anna Pujol-Mazzini talks with WPR’s senior editor, Robbie Corey-Boulet, about Mali’s halting efforts toward transitional justice and reconciliation for a war that began in 2012, amid ongoing fighting in the north and new outbreaks of violence in the country’s central region. If you like what you hear on Trend Lines and what you’ve read on WPR, you can sign up for our free newsletter to get our uncompromising analysis delivered straight to your inbox. The newsletter offers a free preview article every day of the week, plus three more complimentary articles in our weekly roundup every Friday. Sign up here. Then subscribe.